We all make a huge mistake by pouring water of boiled egg.Because lot of vitamin penetrate into water from egg.Of course before boiling we’re washing eggs well..
Calcium that we mentioned above is also good for plants.Just take this water and wait till it gets cool.Then water your plants with this water.You’ll see that your plants will be healthier and thougher. Spray this water to your hair when it gets cool.It contains protein that will help you to have halthier and shinier hair. 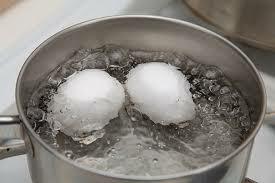 To reduce lime at kettle and pots , boil egg shells in your kettle/pot.You’ll see that egg shells remove lime.